This week some of the volunteers have been preparing Unlocking Warwick’s tree for the Christmas Tree Festival in St. Mary’s Church. We are marking this year’s centenary of the WW1 Armistice by decorating the tree with keys carrying the names of all the 358 Warwick men – and one woman – who are commemorated on the Church Street War Memorial. The keys, reflected in the name of our group, represent our mission to unlock the history and heritage of Warwick, and this year our special project has been to unlock the stories behind the names on the Warwick War Memorial plaques. Before the Christmas Tree Festival opens on 29th November, photographs of some of the Warwick men who gave their lives in The Great War will be added to the tree. Perhaps your relative will be among them. 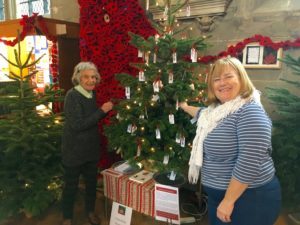 The Warwick Poppies display in the church provides a spectacular backdrop to the Christmas Trees decorated by Warwick community organisations and schools. Both the Tree Festival and the 62,000 hand-made poppies will be on show in the church until December 9th, when the trees will go to new homes in time for Christmas, and the WW1 commemoration gives way to the seasonal festivities. It is well worth a visit to St. Mary’s which will be open each day from 10am to 4pm. And you can vote for your favourite tree. Perhaps you will pick Unlocking Warwick’s tribute to the Fallen of WW1.